Paper bag waist pants are loose, high waist pants with a little ruffle at the top. Imagine taking a paper bag, holding it a few inches from the top, and scrunching it closed with your hand. This is what the top of paper bag pants look like. I found these last fall at Banana Republic. They’re now sold out, but you can still buy BCBG’s Paperbag-Waist Wide-Leg Striped Pants or Rails’ Jess Linen Blend Paper Bag Waist Pants which are perfect for spring and summer. Vertical stripes make your legs look longer. For a solid option with a slimmer leg, take a look at the Paperbag Pants from Madewell. If you don’t need the extra length, try these cropped Madewell x The New Denim Project®Patchwork Paperbag Pants from Nordstrom or these Three Dots Paper Bag Waist Pants from Bloomingdales. Wear your paper bag waist pants with a fitted t-shirt or bodysuit. If it’s still chilly, add a cropped blazer or cardigan. If you like a more streamlined look than paper bag waist pants, try flat front (no pleats or gathering at the belly) high waist pants. I bought these Cassidy Belted Wide Leg Pants on sale at Anthropologie. (They also come in red.) They are slimmer through the hips and thighs than my paper bag pants. With flat front pants, you can tuck in a t-shirt or bodysuit, or wear an untucked cropped top. Madewells’s Emmett Wide-Leg Crop: Button-Front Edition and Free People’s Sasha Pants are similar. For a cropped length, Everlane’s Women’s Wide Leg Crop Pant is cute and is currently on sale. Banana Republic has a beautiful High-Rise Wide-Leg pant in black that also comes in petite. Utility pants are slimmer through the hips, but not tight. They often have large pockets and a looser leg. I found these animal print utility pants at the Anthropologie sale, and love that they can be rolled up when the weather is warmer. Anthropologie has several options in solid, linen and camouflage. These sit a little lower than the other two pants, but still cover my belly button. Santuary’s Explorer Patch Pocket Crop Utility Pants have a button and tab so that the hem stays in place when you roll it up. If you like a wider leg, take a look at Madewell’s Utility Wide-Leg pants. For a fun camouflage print, try & Other Stories’ Cropped Camouflage Workwear pants. As I mentioned at the beginning of this post, paper bag waist pants look best with your top tucked into the waistband. With a flat front or belted style, you can also try a cropped top, or just tuck in the front of your top, leaving the back loose. If you’re not ready to commit to a boiler suit create the same look with a utility pant and a button down shirt in the same color. 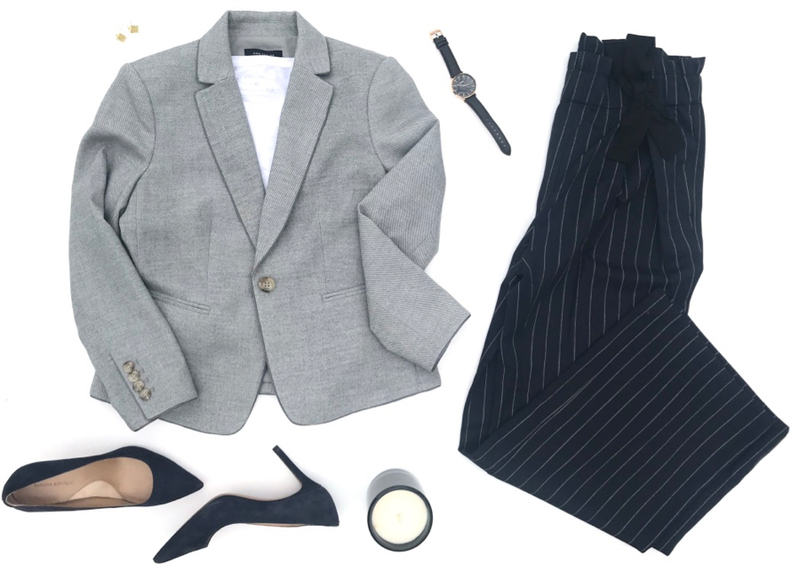 For a sleek, polished look, try a soft silk blouse with your high waist pants. When you tuck in a silk blouse, it won’t add a lot of bulk around your waist and hips. Take a look at this post for more ideas on clothing that will make you look slimmer. Don’t forget to subscribe to my posts, so that you don’t miss more bargains and great buys.